Latest update 23 September 2015. It was fairly calm last night till about 0330 when it got a bit rolly. Neither of us slept well for the next 90 minutes. After that it was not too bad. We get up at 0800 and it is again sunny and quite calm. We go to the beach and have a walk and a swim. The water is much cleaner this morning. There are plenty of little insects buzzing around us, we think they are midges. Michael has plenty of red welts where he was bitten yesterday afternoon. 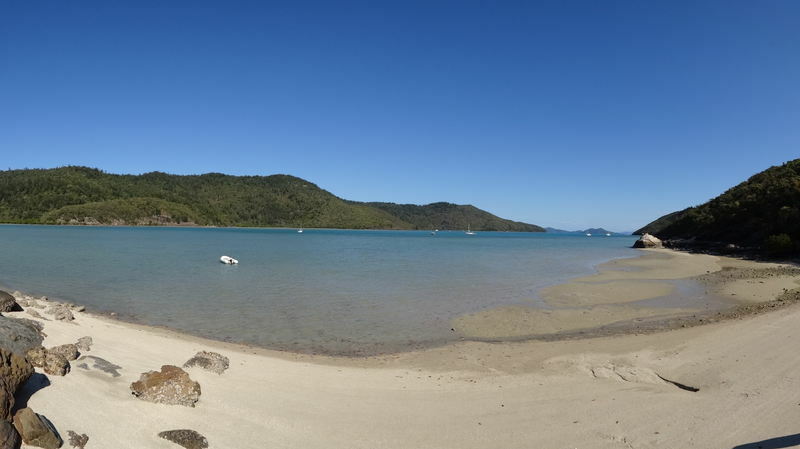 This is the only beach in the Whitsundays where we have had bugs and the first for about three months where we have been bitten. Two more sea planes land and their passengers set up on the beach. Who says there is not much money around? When we get back on Catlypso we have breakfast and Michael transfers 70 litres of water from containers to the port tank. As we expect to have to run an engine for a fair bit of today, he is going to run the watermaker as well. He puts it on at 0900 and starts refilling the containers. At 0940 we leave and motor out to the south through Solway Pass. 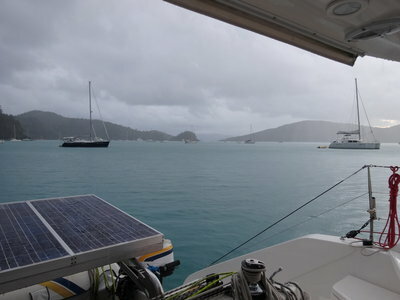 As we expect, there is a strong current from the south so we have to use both engines to make any sort of headway (like all catamarans, we normally only use one engine). Once we get past Frith Rock the current drops off and we go back to one engine. 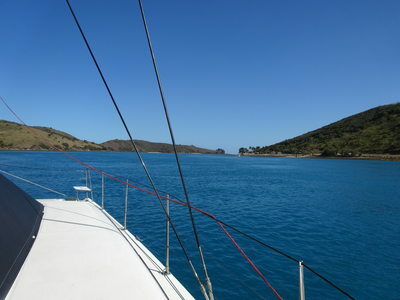 We also pull out the screecher and motorsail towards Hamilton Island. We are doing about 5 knots in 8 to 10 knots of wind. 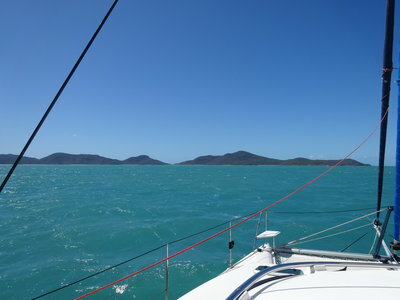 As we near Fitzalan Passage between Hamilton and Whitsunday Islands, we pull in the screecher and motor along with a 2 knot current behind us, hitting over 7 knots. 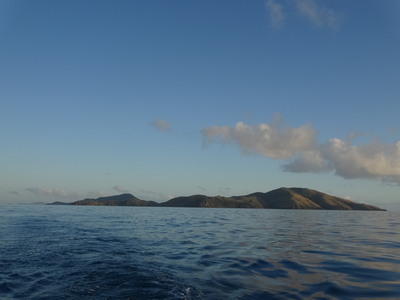 There is less than 5 knots of wind so we do not pull the screecher out till we are near Cid Island. Here the wind is straight behind us and about 8 to 10 knots. We turn off the engine and sail at about 5.5 knots (with a slight current behind). 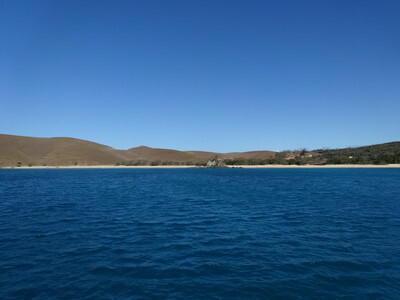 Approaching Macona Inlet (on Hook Island), the wind drops so we pull in the screecher and motor the rest of the way. It is quite shallow at the entrance, although the channel is nowhere as narrow as our chartplotter shows. It is almost low tide and we have about 3.3 metres as a minimum. There are two or three small dolphins as we enter and at least one of them leaps out of the water a number of times as we approach. 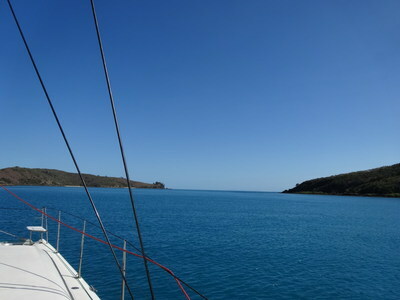 We decide to anchor in the small bay on the eastern side and drop anchor at 1330 in 4.0 metres. This is a very nice bay, not as big as Nara Inlet, but more picturesque as there are more beaches. There are a few boats here, but less than we expected (more come in later). After we have lunch, Michael turns off the watermaker, having made about 110 litres of water (we have had lots of showers!). We then go for a run in Thunderbird 2 to the northern end of the bay. We notice that there is another Lightwave yacht there so we go over to say hello. 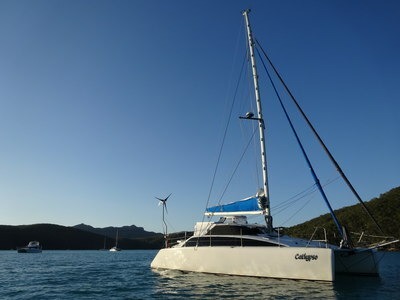 This boat is Brahminy which is a 2006 model owned by Col and Kerry from Darwin. 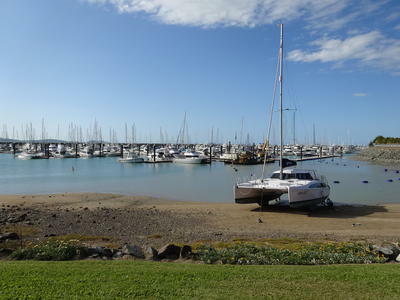 They bought it new and after keeping it there, sailed it down here last year and intend to leave it around Bundaberg in future years. We have a nice talk about their trips and their boat. 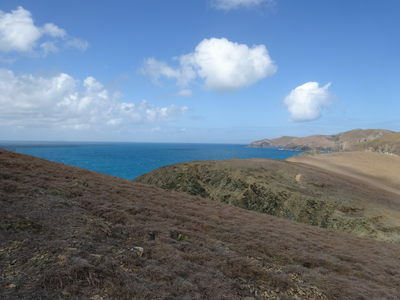 After this we go to a beach towards the end of the bay and then back to Catlypso. We have a couple of tasks we need to do. One is to cut the new dingy davit lines and tie them to the davits properly. Kelly does this as Michael's hand injury makes it hard to tie good knots. We then look at the main sail and try to figure out why we had problems two days ago. We haul the sail up and it sticks as soon as the third and fourth cars move a bit. We drop and haul it up a few times and we are certain that this is the problem. These cars do not seem to be running properly. We put some WD40 on the cars and they then go up and down very easily. We later read we should not have used any lubricant but washed the cars with fresh or soapy water. We will wash the cars tomorrow afternoon to remove the WD40 from these and the other cars. At least we have a main sail to use tomorrow. Just before sunset we go to the nearest beach, this is very nice. Back at Catlypso we have showers and then sundowners. After this Kelly cooks a beef stir fry. The weather for the next week is not going to be good, with winds of over 20 knots from the south or south-east most days. 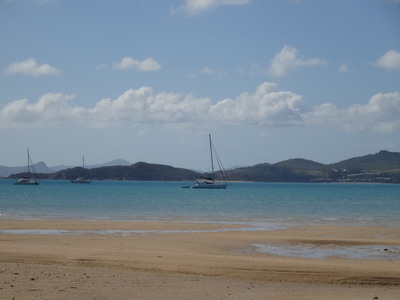 We are heading to Airlie Beach tomorrow morning and we will anchor off Cannonvale to ride out the weather. This will give us the opportunity to refuel and restock. We will also change the oil in our engines as we have just reached 150 hours on each motor since we last changed the oil. It was very calm last night and when Michael woke up at 0600 the water was glass like. We get up at 0745 and have breakfast before taking Veto to the beach. It was sunny early but it is now almost 100% cloudy. We up anchor at 0840 and motor out of the inlet. You need to keep to the western side of the entrance but nowhere near as close as the chartplotter shows. The depth is fairly consistent from the channel marker all the way across to the western shore as far as we can see. 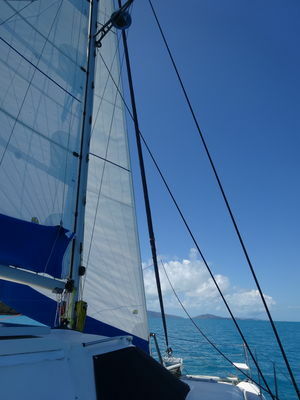 Once outside we turn towards Airlie Beach and pull out the screecher. While it was less than 10 knots where we were anchored, out here it is 17 knots south-easterly. We are sailing with the wind on the port beam and doing about 6.5 to 7.0 knots. 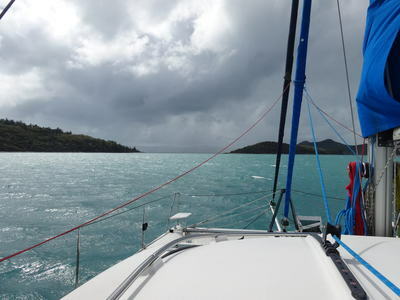 Later the wind increases to 20 knots and we are averaging over 7 knots and hit 8.0 knots quite a few times. The sea is a short and sharp slop, but not too bad. 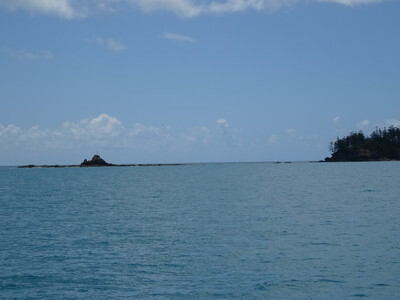 Once we get in the lee of North Molle Island the sea improves dramatically. At 1020 we pass Pioneer Rocks and soon we catch another Lightwave, this time a 35 foot one called Harmonic, which has up its main sail and genoa. This sold in December 2014 so the new owners have obviously come up here for winter. 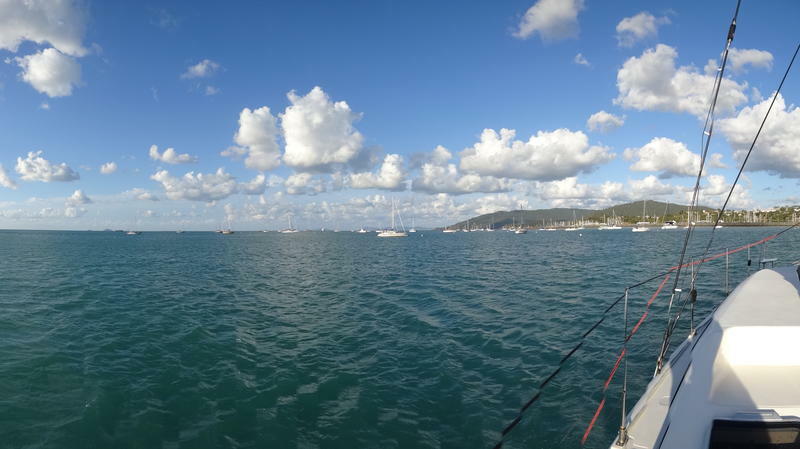 At 1050 we are approaching Airlie Beach and the wind drops to less than 7 knots, so we pull in the screecher and motor the rest of the way. 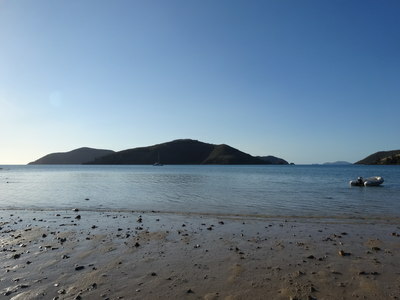 At 1120 we anchor off the boat ramp at Cannonvale and the "exit" from the Abell Point Marina. This is about 50 metres from where we anchored seven weeks ago. We decide that while it is calm, we will change the oil in our two engines. Michael gets everything ready (while Kelly makes some work calls). It is quite warm and inside the engine rooms it is boiling (since the engines have been on). We quickly remove the oil from the starboard engine using the pump and then fill it with new oil. Easy! The port engine also is done quite quickly. We do not need to change oil or fuel filters as they are not due for quite a while. After this, we have lunch. We look at the spinnaker and remove the pulley that was broken during our attempt to pull down a few days ago. After this we head into the public wharf which is actually inside the marina. We take our rubbish with us and put it in the bins at the wharf. We then walk to the northern section of the marina where there is a ship's chandlery. Here we buy another pulley (not exactly the same but we can use it anyway) as well as a larger clip that Kelly wants to use to hold down the main sail. We also get some more fishing lures and trace to replace those we have lost. 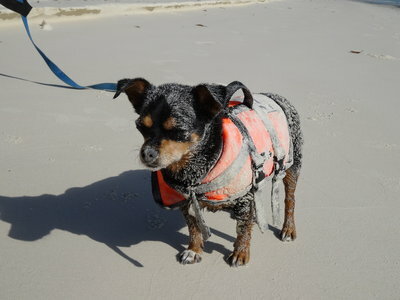 On the way back from the wharf, we go to Shingleys Beach and give Veto a quick walk. We also watch as some workmen change or repair a thru hull on a Seawind 1250 charter boat called Lady L which is up on the beach. Back on Catlypso we install the new pulley and the clip. Michael has a shower while Kelly makes some more work calls (she has to go back to work in seven weeks). We have sundowners and Kelly cooks a turkey roll with potato bake. Yum! Later, the wind which was well over 20 knots about 1700 drops to less than 5 knots. Hopefully it stays that way for the whole night. We expect to be here for at least four nights due to the weather, so we work out a plan to get fuel and food without rushing things. Tomorrow, we start to get the 130 odd litres of diesel we need. It ended up quite calm overnight, we have a good sleep. It is sunny with little wind but an occasional gust of 15+ knots when we get up at 0800. 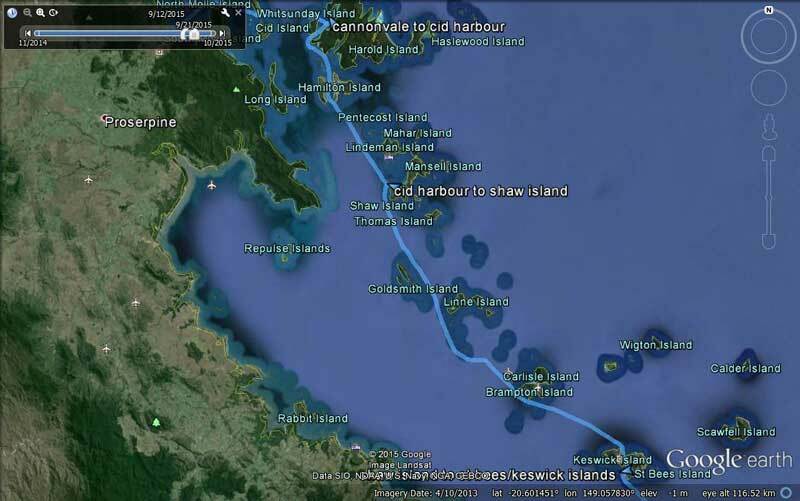 We notice a huge cruise liner anchored off Airlie Beach, our AIS shows it is the Pacific Dawn. We have breakfast and then head to the boat ramp. The actual ramp appears to be blocked off and it is hard to see what is happening. However, we later learn that they are widening the ramp and putting in a floating wharf (to replace the one wrecked by a cyclone). We walk to the Cannonvale Shopping Centre and Michael purchases 44 litres of diesel from the service station and Kelly puts on two loads of washing at the laundromat. While Michael walks back to the ramp with Veto, Kelly goes and does some shopping at Coles. Michael takes the two containers out to Catlypso and then comes back with two more empty ones. He gets another 44 litres of diesel. Once the washing is dry, we walk back, with Michael pushing the trolley with the two containers and the washing basket. Kelly carries the food in a backpack and has Veto on the lead. We have decided to do the washing and shopping in small batches since we are going to be here for a few days. It is also interesting to note that the price of diesel has dropped over 14 cents a litre since we were last here, despite the Australian dollar dropping further. Once back at Catlypso, we read for a while and then have lunch. Michael then puts the fuel from one of the containers of diesel into the main tank, it is now almost full at 193 litres (just under 200 appears to be full). Tomorrow we will fill two more containers, meaning we will have about 303 litres of diesel on board. We also need to get about 15 litres of petrol for the outboard and generator, but that can wait till the weekend. At 1400 we take Thunderbird 2 into the marina and tie up at the public wharf. The lifeboats from Pacific Dawn are coming into the marina and dropping off and picking up their passengers near here. We have to dodge them as we come in. 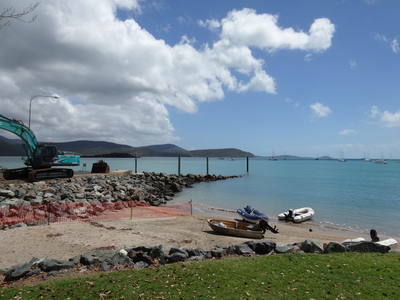 We walk to Airlie Beach town centre along the boardwalk. This is a very nice walk around the water's edge. We go to a shop Grotty Yachty where Kelly orders two "Women Who Sail Australia" shirts. We get some fishing line that we forgot to buy yesterday and then go to the liquor store where we get some beer, wine and port, we probably have enough beer now to last for the rest of the trip. We are back on Catlypso by 1615. The wind is a lot less than when we left, back then it was over 25 knots, now it is probably 15 to 17 knots. Later it drops more and goes back more towards the south. We have sundowners and then lamb rissoles (which we got from the butchers this morning) and potato bake left over from yesterday. Some ice cream tops off a nice dinner. 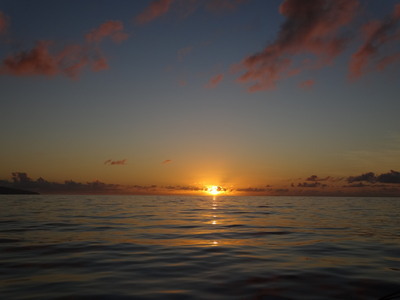 It was calm overnight but at 0420 the anchor alarm went off as the wind went south-west. It went off again about 90 minutes later when the wind went back to the south-east. Apart from those interruptions, we had a good sleep. We get up at 0810 and have breakfast. It is very cloudy and there is a bit of drizzle about. About 0900 we motor in Thunderbird 2 to Whisper Beach boat ramp (we only learnt the name yesterday when we saw the sign about the ramp redevelopment). 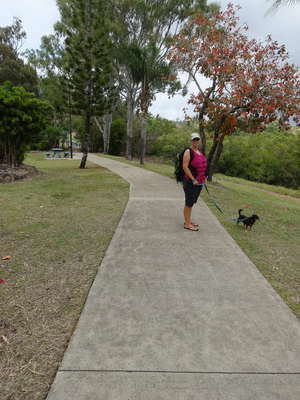 From here we again walk to the Cannonvale Shopping Centre. We get some more food from Coles and another 44 litres of diesel. We now have a full tank as well as 110 litres in containers. We get soaked by heavy rain as we walk back to Thunderbird 2. We are back on Catlypso by 1115. It starts raining again at 1145 and this time it stays around for about an hour. The wind gusts to 30 knots at times. 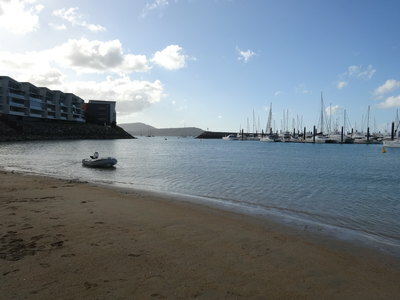 After lunch, we take Thunderbird 2 to the public wharf in the marina and walk to Airlie Beach. We try to have a look at the wrecked ketch near the yacht club but cannot get close enough to see it apart from the masts. Michael spends some time looking for a new hat but the only ones he likes are too small (yes, he has a big head). Kelly also collects her new T-shirts from the Grotty Yachty. We drop into Woolworths as they have some things on special that we want as well as things Coles does not seem to have (eg pork ribs). We also get some gin and sparkling wine. We are back by 1550 and the rain starts again, but not as heavy as before. At 1800 we head off to dinner. 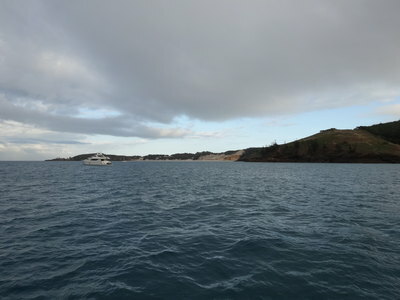 On the way to the public wharf, we stop off at Tribal which is the Lightwave 45 we saw last Sunday at Luncheon Bay. 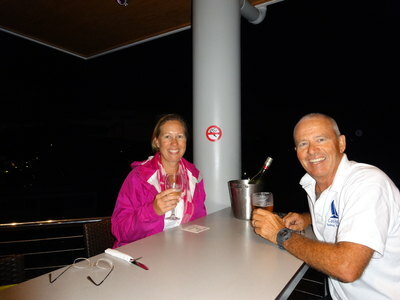 This is owned by Geoff and Brenda who live at Tweed Heads but keep the boat on the Gold Coast. We talk to Geoff (who is on board with his two brothers) for about 15 minutes. We continue on to the wharf and then walk to Sorrentos. This is the restaurant at the northern end of the marina. We had dinner here almost five weeks ago. Tonight we again have pizza, this time con carne and a pork belly one. Again, excellent. We are back on Catlypso by 2015 and watch the first NRL semi-final, Easts versus Melbourne. Melbourne gets up by two points. It was again pretty calm overnight, although it rained on and off for 30 minutes at about 0500. We get up at 0830, it is very cloudy and again looks like we will go backwards in battery power today. After breakfast, Michael puts 95 litres of water from our containers into the forward starboard tank. He also adds some water purifier as the water is all from the watermaker. We are going to fill these at the public wharf later today. Michael works out that we have seen 18 different Lightwave yachts since we left home in early May. 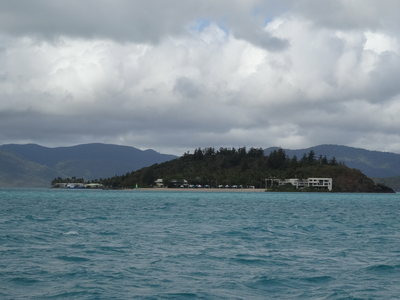 Some are charter yachts based here, but the rest have been doing what we are doing, sailing the Queensland coast. Michael also adds 15 litres of petrol to Thunderbird 2's fuel tank, filling it. He then fills our three 5 litre containers from the 20 litre container, meaning this is now almost empty and can be filled. He also installs the additional microphone holder at the helm so that the remote microphone is higher and hopefully easier to hear. It rains from 0930 till about 1115. When it looks like it has stopped, we head off to the Cannonvale shops again. 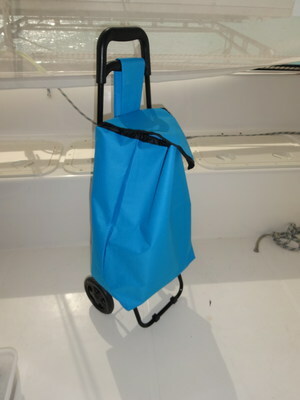 This time we purchase a small shopping trolley (which we should have got months ago) from The Reject Shop ($20). We get some more food from Coles and then buy Italian sausage sandwiches ($3.50) from the RSPCA run barbecue outside the butchers. Excellent value and very, very tasty. They have this every Saturday morning, with a different charity or group running the barbecue. On the way back we fill the petrol container with 20 litres of unleaded. When we get back to Catlypso at 1245 it is now 50% sunny, but still windy. We notice that we got some more water in on the starboard forward side during the rain today, so Michael puts some black silicon on the outside of the window where it appears to be getting in. At 1600 we go to Shingleys Beach so Veto can have a run. We also planned to fill our water containers here (rather than the public wharf) as we knew there was a tap there. However, the tap turns out to not have a handle. Kelly stubs her foot on a barnacle pile which is not great. It bleeds a lot but is not too bad. After Veto has a run, we go to the public wharf and fill our containers. Back at Catlypso Michael puts about 25 litres from the containers into the forward tank, filling it. Tomorrow we need to flush the watermaker so Michael will top up the tank after that and then refill the containers we have used. We have sundowners and then Kelly makes a pork roast with roast vegies. We again watch the rugby league, this time the next two semi-finals. It was calm overnight once again, but once sunrise comes the wind increases. It is sunny when we get up at 0745. We have breakfast and get all our clothes, sheets and towels ready to take to the laundromat. 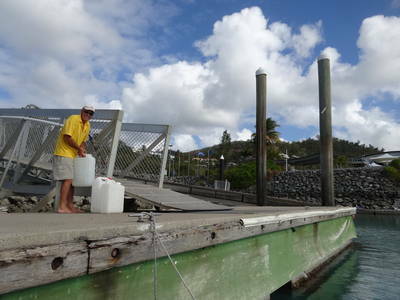 Michael flushes the watermaker and tops up the rear starboard water tank so that we have completely full tanks. At 0930 we go to the shopping centre again. Kelly puts on the washing and then goes to Coles. Meanwhile, Michael attempts to swap one of our gas cylinders (which is almost empty) at the Coles petrol station. After paying for the swap, he discovers they do not actually have a full 4 kg one. He gets our money back. When Kelly comes back, Michael takes the gas cylinder to the caravan park we pass to get here. They say they can fill it, so he leaves it there. Once the washing is dry, we walk back to the caravan park. Guess what, they still have not filled it, even though they have had almost an hour to do it (and said they would). They eventually fill it, $19. Probably a good option for yachties needing gas fills. 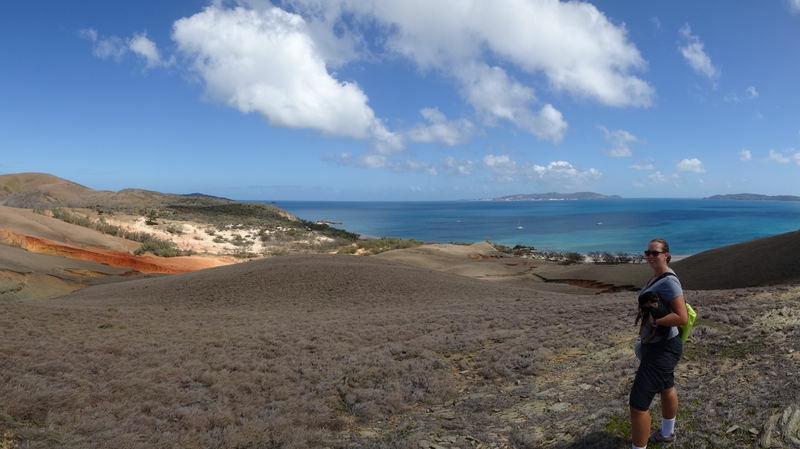 We walk back to Whisper Bay. Already since we have been here the work on the expanded boat ramp has progressed. There is a new section of rock wall at the top of the ramp on the side of the beach. I suspect that the beach may well be unusable for yachties within a month or so. Once completed (scheduled for December 2015) it should be much better as there will be a floating pontoon (as there apparently used to be). Soon after we are back at Catlypso it gets very windy, with constant 20 to 25 knots and gusts of almost 30 knots. After lunch we run the generator for 90 minutes to top up our batteries. We have gone down a lot over the past few days as there was not much sun and also we have watched three games of rugby league on the TV (and another one this afternoon). At 1530 we go to the public wharf and fill up our three empty water containers and then go to Shingleys Beach so Veto can have a run around. When we come back to Catlypso we watch South Sydney Rabbitohs play the Cronulla Sharks in the last semi-final. Souths again play pathetically, the fifth bad performance in the past six weeks. They lose 28-12. So much for defending the premiership they won last year! We have sundowners watching the game and then Kelly cooks creamy garlic prawns and rice. The forecast for tomorrow is still not great, but we are going to leave anyway. 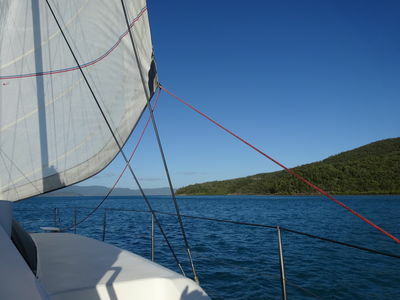 We hope to sail to Cid Harbour or perhaps even further if the wind is more easterly. We will see what happens! It was a bit rolly during the night but not too bad, we slept well. It is sunny and calm when we get up at 0710. Michael takes Veto to the beach for a run and when he gets back we have breakfast. We leave at 0815 and motor out of the anchorage. Once out, we pull out the screecher in 10 to 15 knots of wind and sail at 5.5 to 6.0 knots without an engine. The wind increases in strength to 25 knots or so and we are doing well over 7 knots. We decide to pull in the screecher and put out the genoa. Once we do this we are making 5.5 knots. As we near Pioneer Rocks we pull in the genoa and start an engine as the wind goes onto our nose. From here we motor the rest of the way as the wind is not from the right direction. 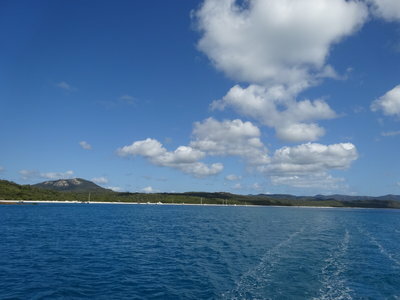 We motor past Daydream Island, home of one of Australia's most famous island resorts, through Unsafe Passage (which is actually safe) between North and Mid Molle Islands. We head for the northern side of Cid Island. Following us, and then finally overtaking us, is Le Tardis, a yacht we first saw way back before Gladstone. It has AIS so we have seen it on our chartplotter for long periods of time. We end up anchoring at 1130 near where we did last time here, off Sawmill Beach in 4.2 metres. On the way we empty our toilet holding tank. It was obviously almost full, as when we rolled on waves we could smell it as some came out the overflow pipe. The trip over was not too bad, considering the wind at times was 25 to 27 knots. The water was relatively calm really, just a metre or so chop. Just after we arrive we hear a US couple report on the VHF that they have hit a humpback whale. They say that there was a mother and baby and they think they hit the baby. The boat apparently came to an abrupt stop. The whales were seen to swim off and the boat does not seem to have suffered any damage. After we have lunch, we do some boat tasks. This includes cleaning the boat speed paddlewheel which has not been working properly on this leg of the voyage. This also means cleaning out the water that comes into the forward starboard bilge as we pull it out. It stinks, you cannot believe how bad it is!! Michael also empties the water from the stern section of the starboard hull, the first time we have done this for over two weeks, there is about 20 litres in there (maybe). While Michael is doing this, he checks the connections from the wind generator which are in the upper starboard engine compartment. The negative wire appears to have not been properly connected, but even when made good, it is still not working. All day there have been rain showers all over the place. 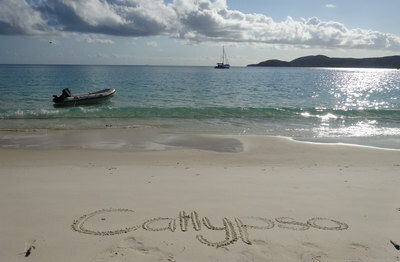 We have had some hit Catlypso as we sailed and even at anchor. Later a charter boat called Fidelio comes in and for some unknown reason, anchors just off our starboard bow. When we comment that they are probably too close, all we get back is abuse and they refuse to move. This boat appears to be chartered by some Americans. Kelly phones the charter operator and complains. Despite their comments that they would not move, they do as she is on the phone (we tried to radio first). Later, the charter operator calls them on the VHF radio and says there has been a complaint. They say they are nowhere near any boat or the shore (somehow the operator thinks this is what we complained about). Michael gets on the VHF and tells the operator that they have moved (hence there is not a problem now) and that they have been abusive. One of the abusive things they have been saying is to refer derogatively to Aboriginals (what the hell this has to do with it we do not know). All that was needed by the crew was to acknowledge that yes, they were a bit close, and they would move. Is it any wonder that the US sometimes has a bad reputation overseas? I bet they are Republicans, gun owners, think Obama is Muslim and born in Africa and hate homosexuals! Anyway, we do not let these people affect our enjoyment of this great spot. We have a few more rain showers come through before we go to Sawmill Beach for a walk. After this we come back and it really pours, but not for long. 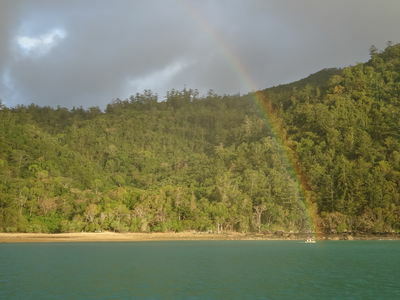 A rainbow is just off the back of Catlypso as well. Michael has a hot shower, his first for five days! Kelly had one earlier, it is hard to think how such a simple thing can be so enjoyable. We really will have to fix the 240 volt part of the hot water heater so we can use when we do not run the engines. After this we have sundowners and then Kelly cooks chilli peanut beef with Thai noodles. Very hot and tasty! Tonight there is a vote for the leadership of the Liberal Party, and as such, who will be the Prime Minister of Australia. Malcolm Turnbull has finally challenged Tony Abbott. As Labor Party supporters, we are really in two minds about this. We hate Abbott, but as long as he is Prime Minister, Labor is assured of winning the next election (should be next year). However, we both also really like Turnbull, thinking that he really should be in the Labor Party. Before we go to sleep, we learn that Turnbull has won. An amazing turn around for Australia perhaps, only time will see. It was really calm overnight, this is a great anchorage. It rained heavily about midnight for quite a while. We get up at 0630 and Michael takes Veto to the beach for a run while Kelly makes tea and coffee. We head off at 0715 and once out of the anchorage, we pull out the screecher. We are immediately doing up around 7 knots in the 15 to 17 knot beam wind. 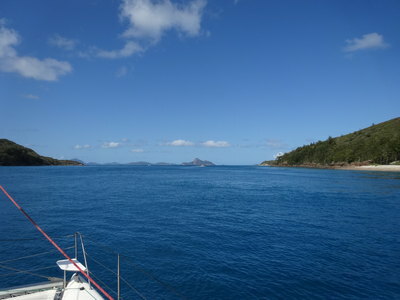 We sail all the way out of Hunt Channel, the passage between Cid and Whitsunday Islands. However, once outside the wind is almost on the nose, not what has been forecast. We pull the screecher in and motor. 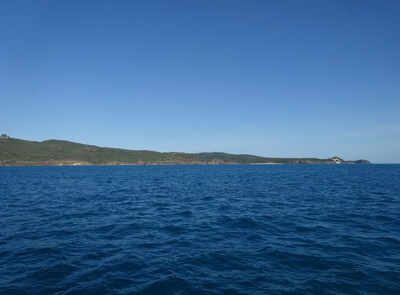 As we pass Reef Point, the south-western point of Whitsunday Island, the seas build dramatically. This is because the tidal current is from the north and the wind from the south. It is very uncomfortable. 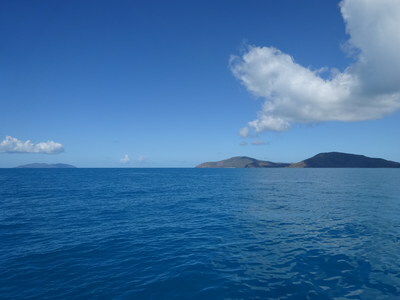 We decide to go between Dent and Hamilton Islands (Dent Passage) as it is somewhat protected from the winds. As we exit the southern end of the passage, we have seas just as bad as before. It is really a roller coaster ride. Once outside the passage, the seas are a bit better, but a bit further on we have another current/wind interaction which is as bad. The wind here hits about 26 knots and is well over 20 knots for about 30 minutes. Once past this the seas calm a little, but it is still not nice, short and sharp 1 to 1.5 metre waves on the beam. We turn a little to port to take them at more of an angle and it is better. All the way we are being shadowed by another catamaran which eventually passes us, we assume they must be running both engines. As we near Shaw Island, the seas calm as the wind drops to 17 knots and we also have protection from Lindeman and then Shaw Island. Our original intention was to sail to Goldsmith Island, but without wind from the right direction, it would be uncomfortable. It will really not matter much to us as tomorrow we can only goes as far as St Bees/Keswick Islands as there is a long jump from there to the next suitable anchorage. We arrive at Shaw Island and anchor off Burning Point Beach about 50 metres to the west of where we anchored over two months ago. We drop anchor in just over five metres at 1050. It is pretty calm here and although there is a bit of wind, there is no swell at all and only a tiny chop. Once anchored we have something to eat (which we did not have before as too rough) and then read till lunch. After this, Michael has a swim and we read some more. We later take Veto to the beach which is a fair distance from the boat. 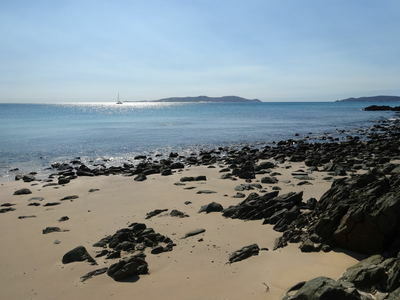 You cannot anchor close as it is really shallow for hundreds of metres from the beach. Back at Catlypso we have showers, sundowners and then Kelly cooks curried sausages and rice. Hopefully tomorrow's weather forecast will be a bit more accurate than today's, we need to get to St Bees or Keswick Islands tomorrow. We had another calm night and when we get up at 0710 it is sunny as well. Michael takes Veto to the "boat ramp" out near the point. This is an area cleared of rocks that looks man made, but we have no idea why it would be done there as there appears to be no old buildings etc located here. While he does this, Kelly makes tea and coffee and just before 0800 we pull up the main sail and a few minutes later we head off. Our plan is to get to Keswick or St Bees Islands, they are right next to each other, so which one we go to will depend on the prevailing wind when we arrive. Once we round the point, we pull out the genoa and sail close hauled. At first we are doing 5 to 6 knots in 10 to 15 knots of easterly wind. However, we soon have an engine on, then off, then on etc as the wind drops and changes direction. 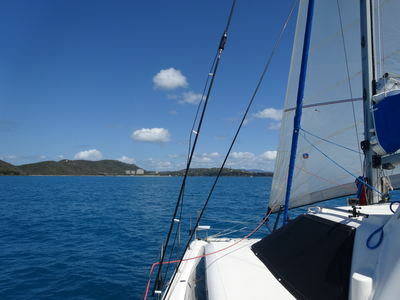 The wind is varying by 30º and from 8 to 12 knots. At 0915 we pull in the genoa as the wind has now gone more south-easterly and we would hit Anchorsmith Island if we kept sailing. The seas are quite calm and get even better after lunch. The wind then goes southerly, so we are now actually getting a bit of assistance for the main sail. 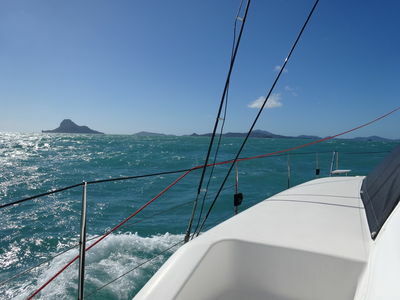 We are doing 6 knots with an engine on and 8 to 9 knots of wind at 30º. At 1130 we decide to sail around the northern side of Carslisle Island rather than go to the south of Brampton Island. We pull out the screecher but shortly after the wind drops to 6 knots and turns back towards the east, meaning this is pointless. We put an engine back on and then turn the watermaker on. We decide a few minutes later to sail to the east and south of Brampton as originally planned as this is shorter. We can now motor sail with the main and genoa, there is only 6 or 7 knots of wind, but we get a bit of assistance. As we approach Keswick and St Bees Islands, we decide to go down Egremont Pass which is the channel between the two islands. Once we enter this channel we have varying degrees of current against us, as much as 2 knots at times. We even have it behind us for a bit, it obviously eddies around a lot. 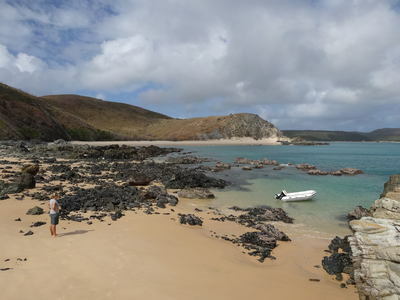 We have decided to anchor at Homestead Bay which is at the southern end of the channel. 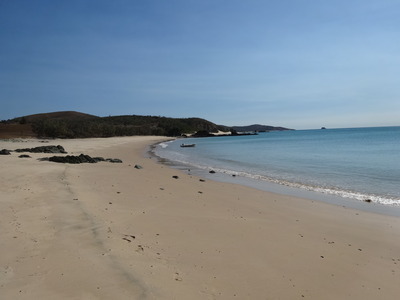 We first look at the second beach from the south but the sea bottom comes up rather rapidly from 20 metres to 4 metres. Shallower than this is coral and/or rocks, so we cannot go closer. The beach closest to the open ocean is 16 metres deep as far as we dare go towards the beach, so we head back to the first beach we tried. After 30 minutes of checking it out and two attempts, we end up anchoring in about 5 metres, but we are hanging in 13 metres. Hopefully the anchor does not move as we will soon only have a bit of chain on the bottom (even though we put out more than 35 metres). Once we are anchored, Michael notices that the watermaker is making a strange noise. The Shurflo pump is making a lot of noise. He turns it off and tries to see what the problem might be. Over the next hour he checks out a lot of things, is the water intake blocked, is one of the filters clogged, is there a blockage elsewhere, is the brine outflow blocked and more. None of these appear to be the problem. The manual says that it might be the pump pressure switch but he checks this as well. He also goes on the internet to see if there is any solution but finds nothing to help. He ends up using Spectra's web site to contact them with details of the problem. Looks like we will have to be more economical with water and also have a better look at the problem in two days time when we think we will be stuck at Middle Percy Island. (Note: it turned out that the problem was two of the three water filters. The second one was very clogged and the third one was the wrong type - this was finally sorted in May 2017). We take Veto to the beach for a run and then when we come back Michael does some of the watermaker checking detailed above. We eventually have sundowners and Kelly cooks chicken schnitzel and mash potato for dinner. We end up turning a lot during the evening, the wind and current seem to be always opposite. Sometimes we do 360s, we have to adjust the anchor alarm from 0.02 nm to 0.03 nm as it keeps going off. Today we hit 2,000 nautical miles since we left Sydney, a big milestone for us. This is almost 4,000 kilometres. Tomorrow we have an early start as we have almost 75 nautical miles to cover and the wind is not expected to be that strong. An early night again. There was little wind overnight and it was very calm at this anchorage. When we get up at 0500 there is no wind, the sea is glassy and it is clear (not sunny as the sun has yet to come up!). We make tea and coffee and at 0540 we leave Homestead Bay. We motor on one engine at 2200 rpm and make 5.9 knots. The wind is less than 5 knots and is also on our nose. A whale passes close to us just before 0700 and then a ketch passes just behind us coming from well out to sea. It is flying the US flag so is obviously just arriving in Australia, probably from New Caledonia. A bit later the wind turns 120 degrees and is now on our starboard beam. We put up the main and the screecher, we get a bit over half a knot from this. We even hit 6.9 knots when the wind increases to 8 knots for a while. At 1145 we drop the sails as the wind has gone astern of us and the sails are just flapping around. We are still doing around 6 knots on one engine, the seas are as flat as we have ever had them (ominous sign of things to come!). During the day we have three lots of dolphins come near the boat but none actually ride our bow. At 1300 we see a very strange sight, a bird standing on the ocean. When we get closer we see that it is actually standing on a small turtle. Before we can get the camera to take a photo, the bird takes off and the turtle dives. Weird! It is a very hot afternoon, probably over 30ºC which would make it the hottest day we have had on the trip. 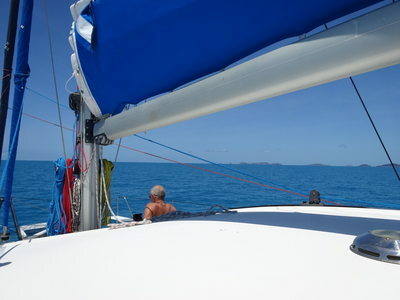 We spend some of the time on the foredeck where it is cooler and there is some shade from the mast. Autopilots are so great. As we come into West Bay at Middle Percy Island, we have a humpback whale cross straight in front of us. We have to stop till we see where it surfaces. Then we see a baby breaching about 150 metres away. 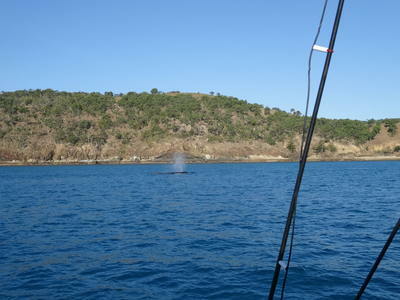 These two whales hang around for hours, we can even hear them singing through the hulls. 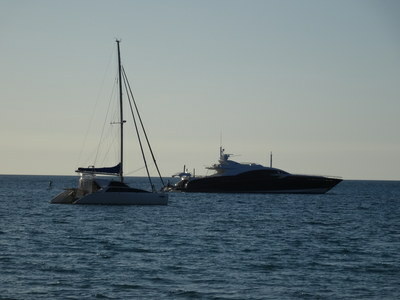 There is a large super yacht called Quantum here and a monohull which we have sailed parallel to since we left St Bees. We think it came from Scawfell Island. The forecast is for lightish northerly winds tonight and a very strong southerly change tomorrow morning. We decide to stay here even though it is a windward anchorage. So far even with 10 knots and 15 knot gusts it is very comfortable. A bad mistake! We take Veto to shore (she did not get to go this morning) and then once back on Catlypso have showers, sundowners and a chorizo pasta for dinner. We go to bed relatively early to try and catch up some sleep lost by our very early start. It was not too bad till about 2300 when the wind all of a sudden increased to 25 plus knots and turned north-westerly. Of course, this meant we are totally unprotected. Over the next hour the wind drops a little but it is still over 20 knots and the seas are probably getting close to one metre at times. The monohull next to us pulls up its anchor at 0000 and motors off to the south. We decide to stay as it is not as bad as we have had in more protected anchorages. By 0100 it has eased a bit more but the seas have probably increased a bit. We get a bit of sleep from about 0130 till 0330 but the seas then (combined with the now lower tide) are making the boat buck like a mule. Last night a small boat anchored between us and the beach, some fishers who are camped on the beach. It looks like the boat is now almost on the beach, it is certainly in the surf zone. We get up at 0515 and decide to leave. 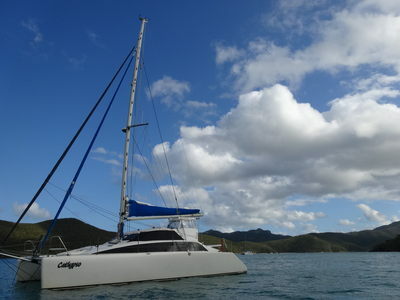 Catlypso is going up and down and in the shallower water (due to low tide and the fact we are now hanging back towards the beach) and we are worried that our rudders will hit bottom. We motor out and around to the south and go into Rescue Bay where we should have went yesterday. The monohull is here as is another very large motor yacht. There are also two small fishing boats anchored off the beach and tents on the beach. It is very calm and at 0615 we anchor between the two boats and go back to bed. At 0700 the wind turns to the south, about four hours before it was forecast to. The wind starts increasing, there are some very black clouds to the south and it is dark. It turns out that some of the darkness is caused by a lot of bushfire smoke and it comes over us. Within 15 minutes the wind is over 20 knots. We pull up anchor at 0715 and motor over to South Percy Island. It is very rough, the seas have picked up dramatically as the wind increases to 27 knots. We have the radar on as the low visibility makes it hard to see boats. Six yachts leave the other anchorage on the southern side of Middle Percy, one is heading here. 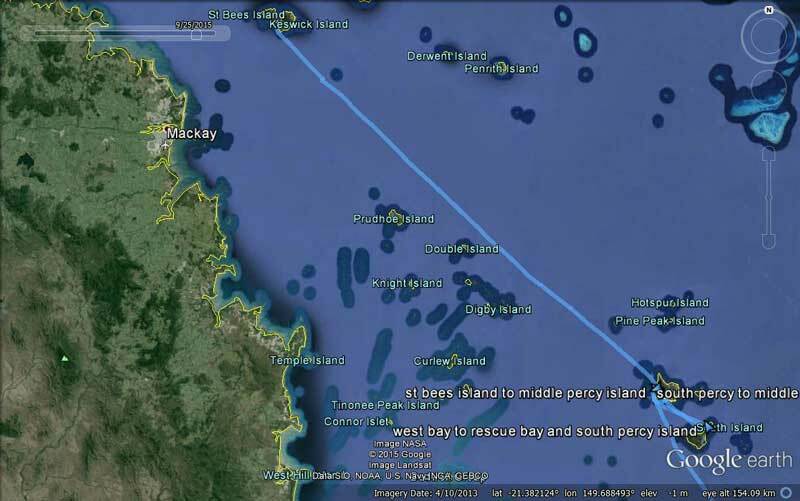 The other yachts appear to mostly go to North East Percy Island. 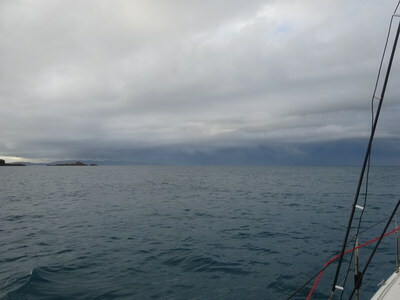 We end up anchoring at 0845 in Rocky Shelf Bay. The wind is still strong but we have no chop and only a very slight swell coming in from the north, probably left over from last night's winds. Another yacht comes in about an hour later. The wind has dropped to 20 knots by 1100 and is now south-easterly and sunny. While Kelly goes to bed to get some sleep (with Veto), Michael decides to have another look at the watermaker pump. The emails he got yesterday from Spectra seem to point to the pump being the problem. Over the next few hours he pulls the pump apart and reassembles it (losing a spring which shot out and disappeared). It may be that the bushes are the problem, the troubleshooting file says they should be one inch long and the should be replaced when they are half an inch. Ours are half an inch. Michael finds a spring to put in to replace the lost one, but when run it squeals even worse. He pulls it apart and notices a screw not in correctly, it now works with the correct noise, but it is certainly not pumping enough water. He will have another go tomorrow by changing the spring to one that is less powerful. At 1420 we take Veto to the beach for a run. It is actually quite calm there. The people off the catamaran next to us walk to the top of one of the hills. We might try that tomorrow. Starting at about 1200 today we heard a few calls on the VHF radio that seem to indicate one or two small fishing boats are missing. Michael calls the Thirsty Sound VMR to try and get some more information (since we saw three small boats yesterday and today) but is told the boats have been found. Later it became obvious that one boat had run out of petrol near the Duke Islands and the other one had failed to catch up with it. This one was still missing, despiute what we were told earlier. There are a couple of boats out looking for the missing, friends, there is no proper planned search. A number of other yachts ask for more information so they might be able to assist but what is provided was next to useless, a 16 foot open tinny with three on board is all we find out. No indication of colour, where it left from or where it was going. We do however learn that it did not have a VHF radio, nor an EPIRB. What sort of idiot goes this far off shore without a radio or an EPIRB (let alone the fact you need to have them by law). At 1515 they are still looking, VMR is aware but no-one has thought to inform Police or AMSA (Australian Maritime Safety Authority). Michael radios to suggest that perhaps it is time they informed the Police. "What a good idea" is the reply! Michael also asks if they had a VHF radio (and someone asks about an EPIRB) and it becomes apparent that they probably have neither (but have flares). Kelly also asks Michael have they contacted Middle Percy Homestead to see if they know anything. Well, at 1600 it is reported that the homestead has phoned VMR and said the boat was in West Bay and has run out of petrol and will be given petrol so they can go home tomorrow. 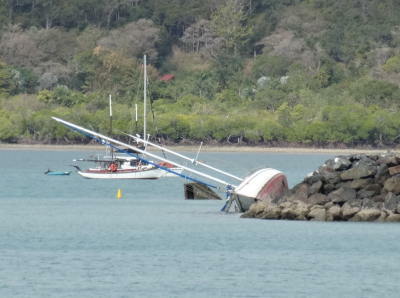 It seems sure that this was one of the two boats we saw this morning in Rescue Bay. At 1715 the homestead radios VMR that the boat has just left West Bay and will be home tonight. Considering it is 30 nautical miles (almost 60 kilometres) from there to Thirsty Sound and the state of the seas, there is no way they will be home before dark (1830), more like about 2015 at the earliest. Idiots!!!! We have sundowners and then Kelly cooks a flat chicken in the oven with vegies. At 1845 a yacht at West Bay, Vivacious, reports that the fishers have come back into West Bay as they have fuel filter problems. They are now saying they will go tomorrow. We go to bed before 2000 as we need to catch up on our sleep lost from an early start and last night's awful seas. Hopefully, if tonight again goes bad, at least we will get some good sleep before then. It was fairly calm overnight and we both sleep pretty well right through till after 0730. The wind appeared to be about 15 knots for most of the night but when we get up at 0820 it is back up to 20 knots, still from the south or south-east. We have breakfast and Kelly calls Vivacious at West Bay to see what it is like there. They report it is rolly. She also asks have the fishers left again but they report they are still having problems with their engine. 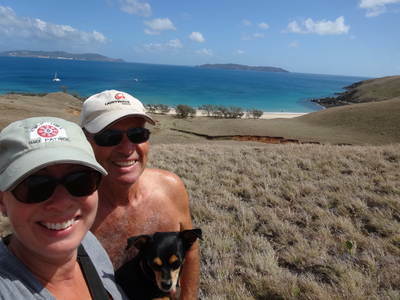 At 0915 we go to the beach and after Veto has a run around, we walk to the top of the hill that overlooks Rock Shelf Bay. From here there are great views north over the bay towards Middle Percy and North East Percy Islands as well to the South East Percy Islets (to the south-east). 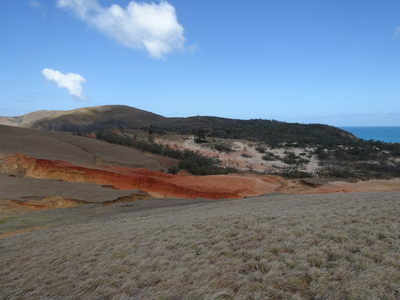 It is an easy 15 minute walk, partially up what was an old road (now overgrown with very low vegetation) that runs from just behind the beach to a gully. 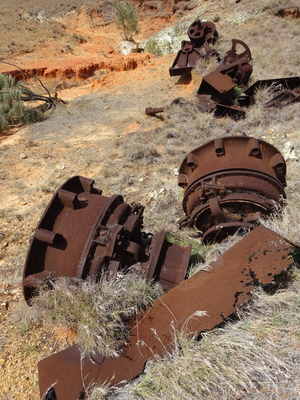 At the top of the road there is some rusty iron that looks like it might be the remains of a water tank. The road does not appear to run to anywhere else. The gully to the west looks like it might have been mined at some time as there is very bad soil erosion. We have no idea what might have been mined. At the beach end of the road there is a large winch and what was probably a steam engine. Who knows what this was for! Anyway, we take our mobile phones with us thinking they might work at the top but there is no reception. Funnily, last night Michael received an SMS and for a short while had one bar on his phone. When we are back on the beach, we have a sit for a while near Thunderbird 2. Michael has a swim and Veto runs around a lot, the first good run she has had in over a week. The tides here are almost 4 metres at the moment so we have anchored Thunderbird 2 off the beach (with the anchor actually on the sand) and as it is now incoming, we drag it closer to us so that we do not have to swim out to get it when we leave. 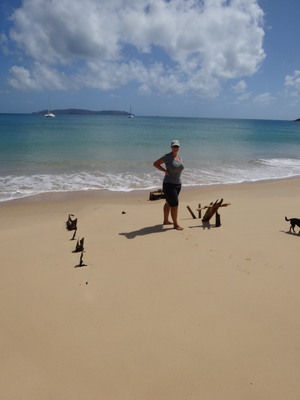 The people on the monohull that came in just after us yesterday are on the next beach, so we walk there to have a chat. On the way we look at the remains of a shipwreck, it looks like an old iron or steel hulled vessel, about 5 metres wide. All that is left are some ribs, what may be the base of a mast, one small bit of hull and another object. The monohull is from Hobart in Tasmania (did not get their name). We have a good discussion about the yesterday's lost boat as they offered at one time to go back over to Middle Percy Island to have a look as they were convinced they saw the boat as they left there yesterday (about an hour after we did). It turns out that it probably was the missing boat and their idea that it was still there was correct. We all agree that the "search" was a disaster. A couple off the other boat here, Trade Runner, comes to the beach as well. It is not their boat, they are just crewing for a couple of weeks. We are back on Catlypso at 1130. The wind today varies a lot, from 15 knots up to 20 knots, but later in the afternoon it goes to 25 knots. Michael puts some more silicon on the starboard forward window that has leaked the past week or so. Yesterday's rough weather let some saltwater get in. He puts silicon along more of the top part of the window and also along the bottom. Let's see how this goes! Later when checking on our navigation laptop he notices a yacht coming towards us from the south-east. It is a US yacht called Quester from Newport, Rhode Island. Michael calls them on VHF 16 and tells them if they are coming here it is calm. They confirm they are going to spend the night here. As they round the point, we take Veto to the beach for another run. When anchoring, we cop a wave over the stern and Thunderbird 2 takes on a lot of water. We put our anchor in the surf zone and the dinghy hangs safely off the beach. When we get back on board, we have to bail out a lot of water as well as run around with the bung out. After a few minutes we are again water free. We go over to Quester to say hello. 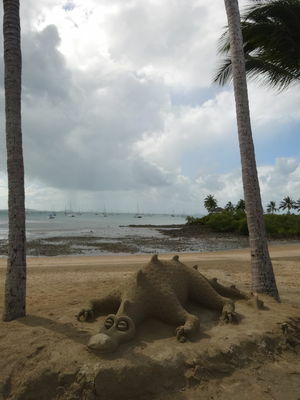 They advise that they are going to the Whitsundays and then later heading to Sydney. Michael tells them to search on our boat name and find this web site and contact us. By 1700 the wind has increased to 20 to 25 knots, bugger, we thought that it might have stayed around the 15 it has been for most of the day. The forecast is now worse than before. It looks like the wind will not go to east or north till Wednesday, so we will be here till at least then unless things change. We have sundowners and then Kelly cooks tacos for dinner. It blew quite strong during the night, but at one time there was a lull when we faced east. When the wind came back, it was all over the place. As such, the anchor alarm went off about six times before 2330. It also rained many times, not super heavy, but enough to wake us up. It was not too rolly and we slept okay. When we get up at 0800 it is very overcast. 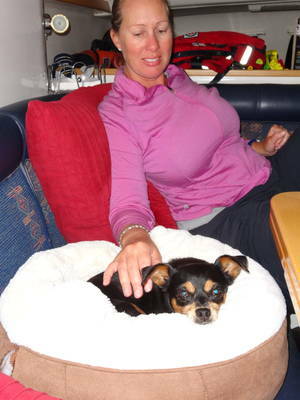 The US yacht Quester left about 0600 and Michael could see it heading north when he got up for a while at 0715. We have breakfast and at 0905 we try to head to the beach. However, there is a small swell that is breaking right along the two beaches in front of us. 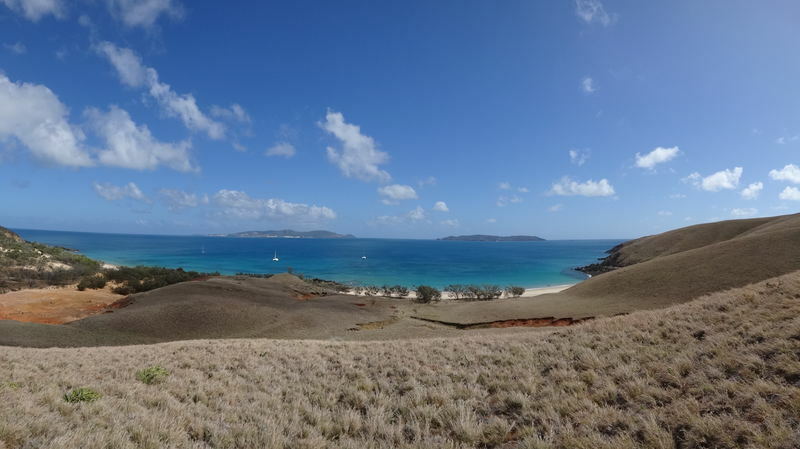 We head to the west around the first of the Four Heads (four small headlands with little beaches in between). This beach is also too rough but we notice a sort of small harbour in the rocks of the headland. We ease towards it and see that we can safely enter and anchor just off a bit of sand without any chance of being swamped (we were yesterday afternoon as mentioned before). After a short walk, we head back to Catlypso. Kelly does some clothes washing and Michael makes some muffins. Kelly then makes some bread. The muffins are great, but we still have to get the bread making right. By 1130 it is sunny but the wind is still 15 to 22+ knots with higher gusts. We talk again to Vivacious on Middle Percy Island and discover that the fishers are still there. Good, it is far too windy for them to head south at the moment. After lunch Michael does some more work on the starboard forward window. He then makes up a USB of music to play over our radio as we cannot pick up any radio stations out here (apart from ABC AM station via our HF radio). We read and listen to music for the rest of the day. We have the usual sundowers and then Michael makes a creamy chicken pasta dish for dinner. When we go to bed we can hear humpback whales singing.